Everyone needs to know how to read and understand the markings on a syringe to avoid mistakes after a trip to the vet. It can be very confusing trying to figure out the difference between 0.1 ml and 0.01 ml when you have never done it before and in a rush to make your pet feel better. Say you take your pet to the vet and the vet gives you medication, they usually go over the dosage with you and write it on the bottle. When you get home, you read the instructions on the bottle and it plainly shows to give your pet 0.04 ml daily. You grab the syringe, put it in the bottle and draw back out to the line that reads 0.4 and give it to your pet. 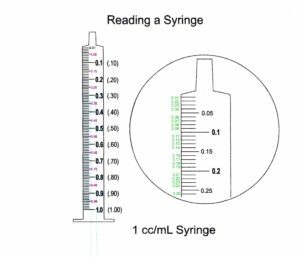 It can be that easy to misunderstand the markings on a syringe and give your pet 10 times the dosage instead of the correct amount. Be careful to locate the decimal point and not to confuse any extra 0s before or after the main number. Sometimes .1 can be written as .10 but it is still 0.1 on the syringe and not 1.0 or 1, just remember the leading (before the decimal point) and trailing zeros have no real significance and are just unnecessary place holders. Error: Error validating access token: Session has expired on Monday, 01-Apr-19 06:49:13 PDT. The current time is Saturday, 20-Apr-19 10:17:21 PDT.